I am sad Herbie has passed, but so very happy he spent the last 12 years at the sanctuary after being retired from research. It is with mixed emotions that I write to you about my dear friend Herbie, the squirrel monkey. I am sad he passed, but so very happy he spent the last 12 years at the sanctuary after being retired from research. I am lucky to have known Herbie since the day he arrived at Jungle Friends. 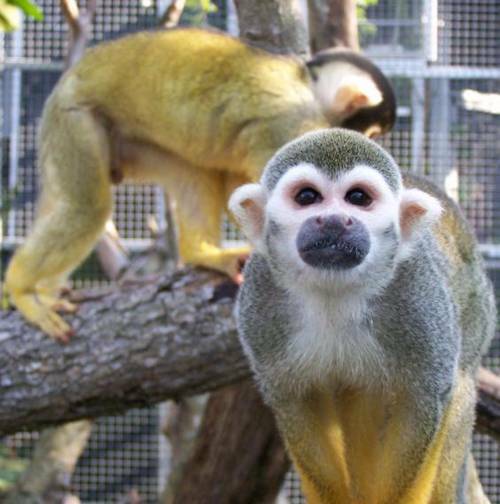 Herbie and Kilroy, along with 6 other squirrel monkeys who were retiring from laboratory research, arrived in 2004 in the midst of several hurricanes! It was meeting Herbie and his friends that convinced me to close down my own business and dedicate myself to working full-time for the monkeys at Jungle Friends Primate Sanctuary! Monkeys who come to Jungle Friends after living in a research lab especially touch my heart. Everytime I looked at Herbie, or one of the other squirrel monkeys who were in the same drug studies, I thought about how lucky they were to be able to go outside now. I wanted to provide the best life possible for them, making sure they had plenty of good food everyday and catering to their individual tastes. Herbie loved to be outside. Every day he would go out and find a spot to bask in the sun. But it wasn't just the sun that Herbie loved. He usually slept outside too. Herbie lived a happy, healthy life here at the sanctuary until last summer when we noticed he was drooling and appeared to be losing weight. Dr. Schirmer discovered the tumors in Herbie's mouth and throat. He removed five tumors from his tongue, but the diagnosis was cancer. Herbie fared better than we expected him to. He looked forward to eating, grapes and earthworms especially, and he continued to seek out a sunny spot to enjoy. In the last few months of his life, we thought Herbie was leaving us several times. Some days he would be listless in the morning, but he always rallied, he wasn't ready to leave us yet. I was thinking he was like the "Energizer Bunny", that keeps on going. However, yesterday Herbie was not responding to Bri when she checked on him at first light. Kari was radioed and when she saw Herbie's condition, she determined it was time for hospice care. Our veterinarian team were contacted and we were instructed on his medication to be sure he was pain free. Herbie lived only a few hours longer, but he was moved outside in the sun with a nice breeze and was with his long-time friend Kilroy when his beautiful spirit left his tiny body. Kilroy visited with Herbie throughout the morning giving him comfort. Kilroy and Herbie's other monkey friends will certainly miss him, I know that I will miss seeing him every morning.